The production process used to make your countertops can also make a big difference in how they score on the green scale. Some countertop fabricators are more eco-sensitive than others, and they make it a priority to produce a high-quality product while remaining committed to environmental stewardship. 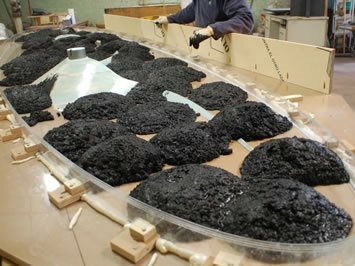 Reusing molds and form-making materials to reduce fabrication waste. Using water-based sealers or natural oil finishes free of VOCs. Using recycled glass and recycled stone-like materials as aggregate substitutes. Obtaining all concrete mix ingredients and fabrication materials from local resources and vendors. Reclaiming and recycling all water used in the manufacturing process. Coulee even collects the concrete sediment and slurry from the grinding of its concrete pieces and then extracts the water for reuse with a special separation system. Not all concrete countertop makers will go to such lengths to be environmentally conscientious. However, if you place a high value on sustainability, ask local countertop fabricators what measures they take to reuse and recycle materials. In addition to the concrete that goes into your countertops, you should also investigate the products being used to facilitate mold removal and to protect the concrete surface from stains. For example, many of the release agents used to keep the concrete from sticking to the forms are petroleum-based. The greener choice is to use one of the newer "earth-friendly" products made from biodegradable vegetable oils, such as Bio-Release EF from Dayton Superior and Farm Fresh from Unitex. Not only are these release agents nontoxic and environmentally safe, they also are odorless and won't affect indoor air quality. Another option is to use a molding material, such as melamine or Plexiglas, that will release from the concrete without an added release agent (see Concrete Countertop Molds). High-performance solvent-based sealers, while very effective at protecting countertops from stains, can be the least environmentally friendly choice because most of them contain VOCs, says Jeff Girard of The Concrete Countertop Institute. Fortunately, more manufacturers are introducing water-based alternatives for those who value the environment. 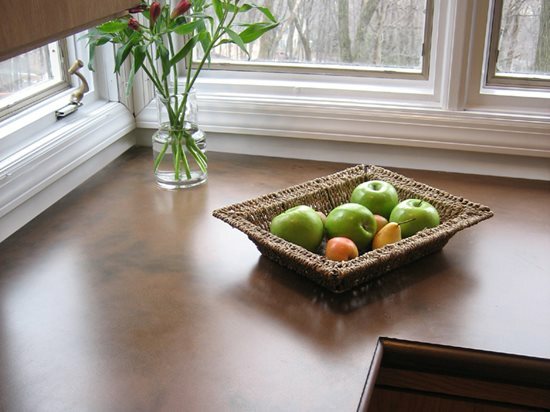 Examples include V-Seal 101 (www.vseal.com) and Pro-Seal US II-A (www.prosealproducts.com).Another option is to protect the countertop surface with a coat of natural beeswax. However, this finish won't be as effective as a good sealer at protecting the concrete from stains, and it will require regular reapplication.